He has been called "one of the most brilliant colorists in the history of American art." (Barbara Ann Boese Wolanin) I think that must be so because I was immediately drawn to this trio of paintings that appeared this Sunday at the Munson-Williams-Proctor Art Institute. For those lucky enough to live within driving distance of Utica in upstate New York this type of revelation will be no surprise. A museum comprising 60,000 square feet and a collection of 25,000 art works has the opportunity to keep things moving and fresh and it does. Exhibitions drawn from the vaults, of medieval icons, Rembrandt drawings, or the artists group The Irascibles, are extraordinary events but ordinary here. And in a comparison not intended as invidious, MWPAI is home to four times as much art as the Albright-Knox Gallery in Buffalo. In short, this is the most underrated museum I have ever visited. But back to Arthur B. Carles (1882-1952), also underrated. 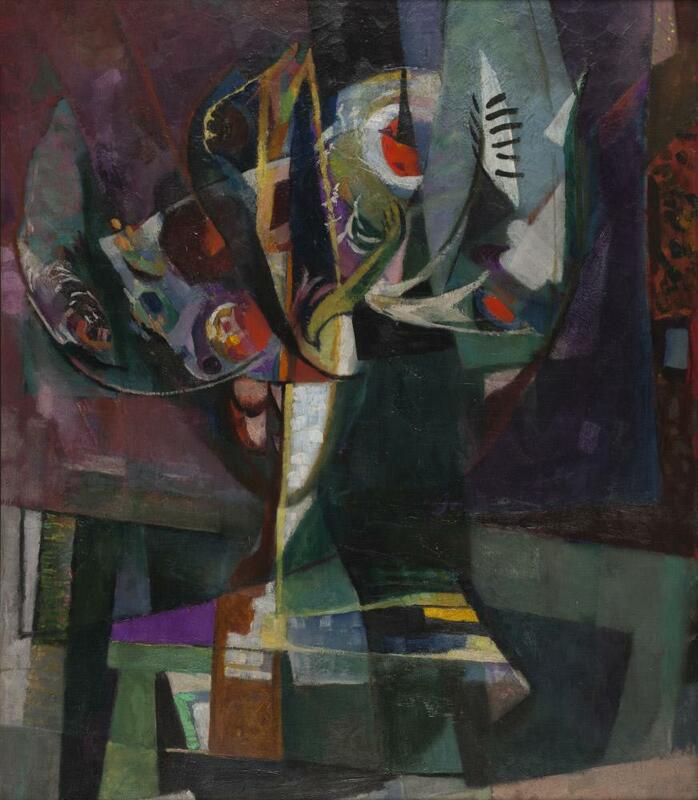 If Arthur Carles had been born in New York instead of Philadelphia, or if he had been able to stay permanently in France, his art and his influence would be much more salient today. 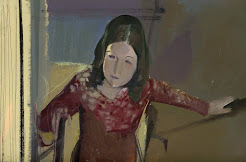 That he escaped as often as finances permitted from the Procrustean bed that was the Philadelphia art world of his day is telling as is the fact that, in spite of honors at home and abroad, Carles did not receive a solo exhibition in his home town until 1935. What drew me to these paintings was there in his work from the beginning; even Carles's student pictures were admired for his bold use of color. Color, he would later teach his own students, is the basis for painting as he understood it. 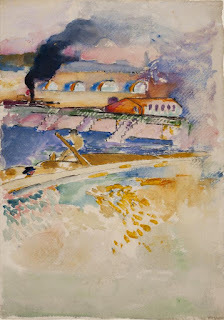 In the watercolor Paris Lanscape (c.1908) he achieves a luminous impression from his juxtapositions of colors, green and yellow, yellow and blue, blue and red. 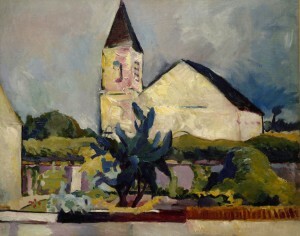 In lesser hands what could have been loud, as in blaring, in Carles's hands was an ingenious harmonization of the lessons he learned from looking at Cezanne's structured blocks of color (Paris Rooftops, painted c.1921)) and Gauguin's palette ( the vegetation in The Church, painted c.1910). Arthur Carles, Jr. was born in Philadelphia. As the son of a watchmaker he able to attend the Pennsylvania Academy of Fine Arts after graduating from high school in 1900 thanks to a scholarship. There his teachers William Merritt Chase and Cecilia Beaux introduce him to French Impressionism but when another scholarship enabled Carles to visit Paris in 1907 it was Post-Impressionism that won him over with its riotous use of color. In Paris Carles found artists who share his experimental approach to color. He took lessons from Matisse and although he dismissed the man as “a bourgeois” he admired the work. Matisse, for his part, would spend time with Carles in Philadelphia in 1931 while painting a series of lunettes for the Alfred Barnes Collection. Edward Steichen, then a painter himself, became a close friend with whom Carles spent happy summers in the small town of Voulangis east of Paris. It was Steichen who introduced Carles to Mercedes de Cordoba, a Spanish mezzo soprano and flamenco dancer. The couple wed in 1909 but seldom lived together during their sixteen year marriage; they had one child, a daughter born in 1913 who studied with Hans Hoffmann and became an artist under the name Mercedes Matter. When Carles returned to America in 1910 he received an invitation from Alfred Stieglitz to join Gallery 291 in New York and given his first one man show there in 1912. Then he exhibited The Church (c.1910.Metropolitan Museum of Art, NYC), painted in Voulangis, at the Armory Show in 1913; apparently the notoriety of the show itself did not extend to Carles's work which earned no mention in reviews. American and European modernists had never before been seen under one roof and the public was shocked - and thrilled to be shocked..
From 1917 to 1925 Carles taught at his alma mater but he was eventually dismissed for sins against its conservative academic tradition. After that he taught privately and never lacked for students. Carles would teach his students that color was the basis of all painting, a belief only reinforced by his wartime work supervising ship camouflage operations at the Philadelphia Navy Yard. And as you can see in Derivation (painted between 1929 and 1933) the lack of an academic position seems to have freed his imagination. Those cubist flowers look the way a bee might feel -overwhelmed by beauty coming from every direction. Carles suffered from depression and alcoholism, and was hospitalized several times during the 1930s. After suffering a fall that partially paralyzed him, apparently caused by a stroke, Carles was unable to paint and was confined to a wheelchair for the rest of his life. 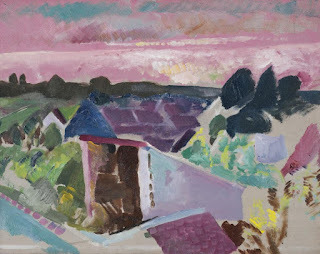 When he died in June 1952 he was eulogized both as a painter and a trans-Atlantic purveyor of modernism. To have three such varied examples of Arthur Carles together in one place is a satisfying treat.